Tesla's a pretty interesting car company, and I suspect we'll be writing stories about them for a long while. They also have a nice, orderly naming convention for their cars, having announced and/or released a Model R (or just Roadster), a Model S, and soon, a Model X. Other model names/letters have been hinted at or speculated about, but there's been no comprehensive list. 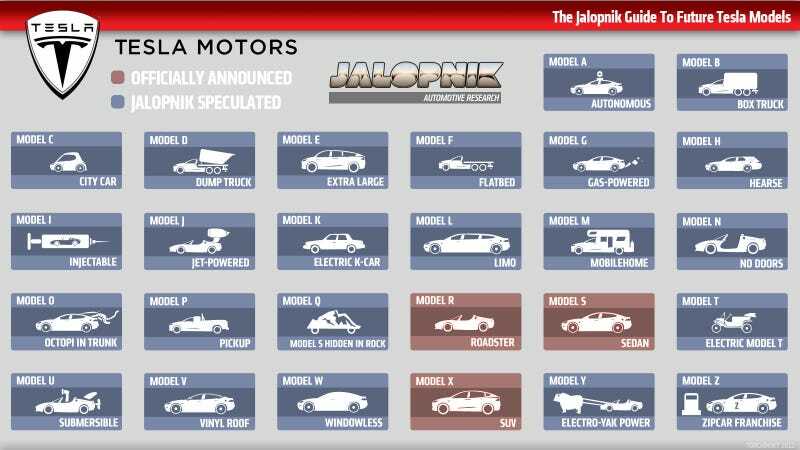 Based on a crack team of Jalopnik investigators and spies, we have learned a great deal more. The "letters" used by Tesla appear to be part of a complex, 26-symbol set. Operatives were able to determine all the members of this set, and even came up with a song as a mnemonic to remember the order. Brilliant! After the model names, the Jalopnik Mainframe (located deep underneath Los Angeles, in Bronson Pinchot's abandoned humidor) was fed blueprints and speculative CAD files and came up with the vast array of electric-drivetrain vehicles planned by the company. So, study this carefully! This is basically a roadmap of Tesla for the next 50 years. Click to enlarge to a size suitable for framing.